Osiris represents the cyclical aspect of nature—the physical creation and its cycles of becoming and returning. – the shepherd’s crook (being the shepherd of mankind). – the flail symbolizing the ability to separate wheat from chaff. – the scepter of supremacy. Osiris is written with the glyph of the throne and the eye, combining the concepts of legitimacy and divinity. Isis’ glyph is the throne/seat and as such she gives her husband Osiris the divine power to rule. The concept of divine in mortal form is not just limited to human beings. Osiris represents the process, growth, and the underlying cyclical aspects of the universe—in part and as a whole. The main theme of the Ancient Egyptian texts is the cyclical nature of creation being born, living, dying, and regenerating again. The most obvious and universal cycle to humans is the solar cycle. The sun—born anew each morning – crosses the sky, ages, dies, and travels through the underworld during the night in a cycle of regeneration. The universal cyclical number par excellence is SEVEN. Seven of something frequently makes a complete set—the 7 days of the week, 7 colors of the spectrum, 7 notes of the musical scale, etc. The cells of the human body are totally renewed every 7 years. The Egyptian word for the number seven is Sab-aa, which is the same word for Lion. One of Osiris’ titles was The Lion; the same word as Seven. The zodiac sign of Leo was chosen to signify the time of the year when lions go to the water’s edge to drink at the beginning of the rainy season. Not only is Osiris is related to the number seven and to the Lion, but he is also associated with water supply, as we will see later herein. Since Osiris represents the latent power of resurrection to begin a new cycle, the Egyptians depicted the deathbed in the shape of a lion being number seven (being Osiris). Osiris’ face is depicted in a black color when representing the death state. And he’s shown with a green face when representing the resurrection/renewal state. Etymologically, the relationship between Re and Osiris becomes self-evident. The Egyptian word for Osiris is Aus-Ra. The word Aus means the power of, or the root of. As such, the name Ausar consists of two parts: Aus-Ra, meaning the power of Ra, meaning the re-birth of Ra [Re]. The principle that makes life come from apparent death is and was called Ausar, who symbolizes the power of renewal. Aus-Ra represents the process, growth, and the underlying cyclical aspects of the universe. 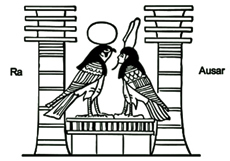 The perpetual cycle of existence—the cycle of life and death—is symbolized by Ra (Re) and Ausar (Osiris). 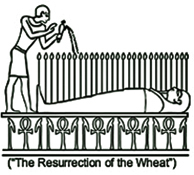 Ra is the living neter [god] who descends into death to become Ausar, the neter [god] of the dead. Ausar [Osiris] ascends and comes to life again as Ra [Re]. The creation is continuous: it is a flow of life progressing towards death. But out of death, a new Ra is born, sprouting new life. Ra is the cosmic principle of energy that moves toward death, and Ausar [Osiris] represents the process of rebirth. Thus, the terms of life and death become interchangeable: life means slow dying; death means resurrection to new life. 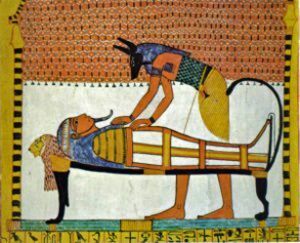 The dead person in death is identified with Ausar [Osiris], but he will come to life again, and be identified with Ra [Re]. This is Ra[Re] who comes to rest in Ausar[Osiris]. This is Ausar [Osiris]who comes to rest in Ra[Re]. Isis represents the female principle in the universe, and her allegorical husband Osiris represents the universal male principle. Osiris represents the embodiment (emanation) of the moon, reflecting the light of the Isis The Sunshine. Egyptian texts describe Osiris as The Moon. The cycle of the moon is the perfect manifestation of the cyclical nature of the universe—in whole and in part. The moon waxes and wanes and then disappears for a few days, to reappear again anew, representing life, death and rebirth—again and again and again. The principle that makes life come from apparent death was/is called Ausar [Osiris], who symbolizes the power of renewal. Osiris represents the process, growth, and the underlying cyclical aspects of the universe. Therefore, he was also identified with the spirits (energies) of grain, trees, animals, reptiles, birds, etc. 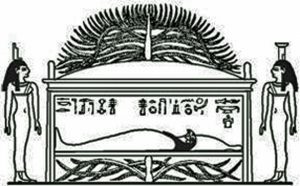 The most impressive representation of the concept of regeneration, namely Osiris, is the illustration depicting “The Resurrection of the Wheat” with 28 stalks of wheat growing out of his coffin. The cycle of 28 (7×4) is also the menstruation cycle in women, upon which all human life depends. It is also interesting to note that Osiris’ life (or his reign), according to the symbolic Egyptian Model Story, lasted 28 (7×4) years. The Tet [djed] pillar is the spinal column of creation, which is associated with Osiris as his sacred symbol. Tet [djed] pillar represents lopped trunk of the cedar tree, symbolizing the possibility of renewed life. 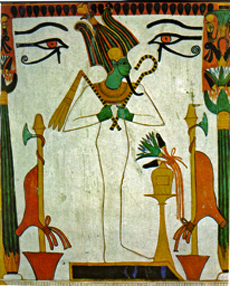 It is depicted here as Osiris’ body being surrounded by a cedar tree. Since the Tet Pillar represents renewed life, it appears (together with the Isis symbol) almost always in all tombs and most (if not all) temples as well as papyri and jewelry. Isis’ symbol was called Thet, which sounds very close to Tet, being the symbol for Osiris. Isis’ Thet is depicted as a knot that appears to be a stylized female genitalia. The Isis amulet conveys the virtue of the blood of Isis, her strength, and her words of power. Tet [djed] represents the sacrum of Osiris; i.e. the part of the back that is close to the sperm duct, for it symbolized the seed of Osiris. It was, then, natural to depict the genital organs of Isis as a companion amulet; for by the two amulets, the procreative powers of man and women would be symbolized. The four elements of creation represent the four elements necessary to matter. Osiris represents water as the fertilizing element, fertilizing the soil of Mother Earth—being Isis – to bring forth all creations. Osiris as the water represents the most important cycle in creation; namely, the ‘water cycle’. Egyptians used the four simple phenomena (fire, air, earth and water) to describe the functional roles of the four elements necessary to matter. “The Egyptians simply give the name of Osiris to the whole source and faculty creative of moisture, believing this to be the cause of generation and the substance of life-producing seed; and the name of Seth [Typhon] they give to all that is dry, fiery, and arid, in general, and antagonistic to moisture. As the Egyptians regard the Nile as the effusion of Osiris, so they hold and believe the earth to be the body of Isis, not all of it, but so much of it as the Nile covers, fertilizing it and uniting with it. From this union they make Horus to be born. 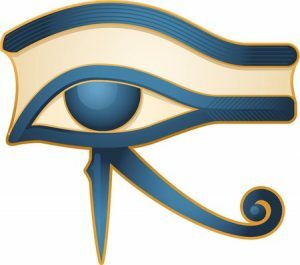 The all conserving and fostering Hora, that is the seasonable tempering of the surrounding air, is Horus The insidious scheming and usurpation of Seth [Typhon], then, is the power of drought, which gains control and dissipates the moisture which is the source of the Nile and of its rising”. Here we see how Osiris is representing the water cycle as the fire/heat evaporates the water, which will condensate again and fall as water to the surface of the Earth. Osiris represents the prospects of inundation and renewed vegetation. Osiris is identified in the Egyptian texts as: Our Crop and Our Harvest. In order to reunite with our divine origin, the Egyptians followed the allegorical model of Osiris. According to the Ancient Egyptian traditions, Osiris came to Earth for the benefit of mankind, bearing the title of Manifester of Good and Truth. As per the Egyptian Model Story, despite his allegorical death, Osiris carried the living seed of eternity—Horus—within him. As such, Osiris represents the mortal man carrying within himself the capacity and power of spiritual salvation. All dead persons were/are equated to Osiris, because Osiris is a cosmic principle, not a historical person. Let me repeat this fact: All dead people—males and females—rich and poor—are ALL called Osiris in all funerary texts of all ages. Every Egyptian’s hope was/is for resurrection in a transformed body and for immortality, which could only be realized through the death and resurrection of Osiris. Ancestors are those people who once lived on Earth and later returned to Heaven. Osiris is the model ancestor—for Osiris once lived (allegorically speaking) on Earth and later returned to Heaven. The concept of Osiris as the Grand Ancestor extended to the Ancient and Baladi Egyptian’s entire sociology and existence. From beginning to end, a long chain of ancestral precedents became a custom and a law. Every Egyptian’s duty was/is to honor their ancestors with responsible actions and good deeds. Everything they did – every action, every movement, every decree – had to be justified in terms of their ancestral precedence to abide by and to explain their actions and deeds. The Ancient and Baladi Egyptians’ entire sociology and existence, from beginning to end, is nothing but a long chain of ancestral precedents—every single link and rivet of which became a custom and a law – from their spiritual fathers unto themselves, in the flesh. Plato and other writers affirmed the complete adherence of the Egyptians to their own traditions. Nothing has changed with this attitude since then; for each traveler to Egypt since that time has confirmed the allegiances to such conservatism. Every Egyptian learned/learns to honor his/her ancestors because s/he will be judged by them—as symbolized in Osiris, the Grand Ancestor, who, as the great judge of the dead, presides over the procedures of the Day of Judgment. Osiris is always depicted underneath a domed roof. The dome shape signifies GOLD—the ultimate goal of the spiritual Path. Like Osiris, ancestors with special spiritual powers—like Saints—are always found buried under a domed small building. Such domed buildings dot the Egyptian landscape. More about this point is found in our publication Egyptian Mystics: Seekers of The Way by Moustafa Gadalla. It takes a life to save a life. Osiris came to Earth for the benefit of mankind, and was sacrificed and became the Lord of Judgment in the other world. Osiris is the allegorical renewal of life. One must die—figuratively—to be born again. We find a similar and later conception in the Abraham religion, where Abraham sacrificed a ram to save the life of his son. One of the most important rituals in the Egyptian annual festivals since ancient times is the ritual sacrifice of the bull, which represents the renewal of the cosmic forces through the death and resurrection of the bull deity. The Egyptians connected Apis, both living and dead, with Osiris. He was the son of Osiris and was the “living image of Osiris”. 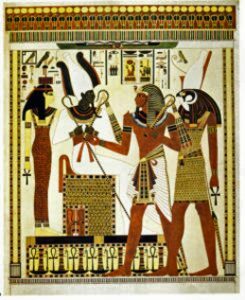 After the death of his body, his soul was thought to go to heaven, where it joined itself to Osiris and formed with him the dual-god Asar-Hepi, or Osiris-Apis. Bull is basically the incarnation of Osiris. Classical writers of antiquities assert that Apis the bull was sacrificed for Osiris since the time of Mena, 5,000 years ago. In the Ancient Egyptian traditions, the wine was sacrificed for the blood of Osiris. Egyptians felt obligated to eat the meat of the sacrificial bull and to drink wine during festivities in order to receive the divine blessing. That the wine was sacrificed for the blood of Osiris is depicted in practically all Egyptian tombs. The walls of the Ancient Egyptian tombs show vintners pressing new wine, and wine-making is everywhere as a constant metaphor of spiritual processes and the themes of transformation and inner power. The winemaking process of growing, harvesting, pressing and fermenting is a metaphor for spiritual processes. The soul, or the portion of god within, causes divine ferment in the body of life. It’s developed there, as on the vine, by the sun of man’s spiritual self. The fermented potency of wine was, at its deepest spiritual level, a symbol of the presence of the incarnated god within the spiritually-aware person. The tomb occupant is shown here drinking wine—the sacrificial blood of Osiris. In the Book of the Dead, Osiris is addressed as the “Bull of Amentet”; i.e. “Bull of the Other world”. In Ancient Egypt, the Mother deity, Isis, had a son who, in the form of a bull, was sacrificed annually in order to assure the cycle of the seasons and the continuity of Nature. As per present practices, ancient writers asserted that it was the mother who was chosen to produce a calf with particular qualities—he was The Bull of His Mother, so to speak. “Apis, also called Epaphus, is a young bull, whose mother can have no other offspring, and who is reported by the Egyptians to conceive from lightning sent from heaven, and thus to produce the bull-god Apis”. The religious connotations of this sacrifice are an echo of a sacrifice in the sacrament, where we are reminded of Christ’s death so that mankind might be saved. In essence, this is a genuine religious drama in which, as in the Catholic Mass, a god is worshiped and sacrificed. Osiris represents the process, growth, and the underlying cyclical aspects of the universe—the principle that makes life come from apparent death. Osiris represents the rejuvenation/renewal principle in the universe. Therefore, in the Ancient Egypt context, the bull had to suffer a sacrificial death to ensure the life of the community. The sacrifice of the holy animal and the eating of his flesh brought about a state of grace. Small tablets in Ancient Egyptian tombs sometimes represent a black bull bearing the corpse of a man to its final abode in the regions of the dead. The name of this bull is shown to be Apis, because Osiris represents the state of death in everyone/thing—the divine in mortal form. Throughout Egypt and in all eras, bulls are depicted in tombs and temples, to be sacrificed during the festivals to renew and to rejuvenate life. In the Egyptian allegory, Osiris’ wife Isis was able to conceive her child Horus without Osiris’ impregnation. It was the first recorded Immaculate Conception in history. 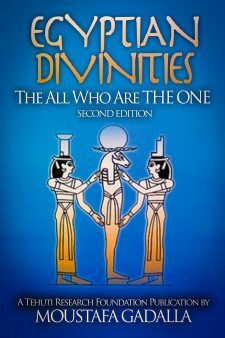 The Egyptians looked at Osiris and Horus as One, in two complimentary forms. Likewise, in the Bible teachings, Christ is sometimes referred to as the “Son of God” and at other times simply as God. The Egyptians believed in the anthropomorphic divinity or Horus (Christ) ideal, whose life in this world and the world beyond was typical of the ideal life of man. The chief embodiment of this divinity were Osiris and his son, Horus (Christ). Neither Osiris nor Horus were ever regarded as historical. Osiris represents the mortal man carrying within himself the capacity and power of spiritual salvation. Osiris symbolizes the subconscious—the capacity to act; to do; while Horus symbolizes consciousness, will, and the potential to act; to do. From the earliest period of Ancient Egyptian history, the Egyptians believed that Osiris was of divine origin: one partly divine and partly human, who had raised himself from the dead without having seen corruption. What Osiris had effected for himself, he could effect for man. As a model, the Ancient Egyptians believed that what Osiris did, they could do. Because he had conquered death, the righteous, too, might conquer death and attain everlasting life. They would rise again and attain everlasting life.
. . . that which thou sowest is not quickened, except it die. Another example is the biblical wine symbolism, which can be traced to Ancient Egypt, where the walls of the Ancient Egyptian tombs show vintners pressing new wine and wine-making is everywhere a constant metaphor of spiritual processes and the themes of transformation and inner power. In places in the Egyptian scripts, Osiris himself was characterized as the vine. The soul, or the portion of god within, causes the divine ferment in the body of life. It’s developed there, as on the vine, by the sun of man’s spiritual self. The fermented potency of wine was, at its deepest spiritual level, a symbol of the presence of the incarnated God within the spiritually-aware person. But who do want to be like so that he can guide us back to The Father? The answer is His Son—Horus. On Judgment Day, Horus, son of Isis, acts as a mediator between the deceased and The Father Osiris. All Egyptians wanted/want The Son of God Horus to bring them (dead) to life—as depicted in these Egyptian tombs. Likewise, in Christianity, the Christian motif was/is based on the need for a mediator; a son of god as an all-powerful shepherd and a begotten savior living among the common man. Glory is the radiant beauty of splendor and magnificence—heaven or the bliss of heaven—which is attained by the highest achievement. Glory is represented in artwork as a halo or a circle of light. In Ancient Egypt, the neter (god) Ra (Re) represents the Light and is depicted as a circle.